State Senate Democrats, in the last hour or so, have selected Sen. Carlos Cisneros of Questa as their nominee for Senate President Pro-tem. 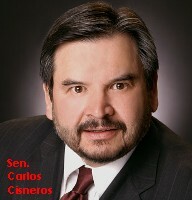 Cisneros, who has been in the Senate since 1985, defeated incumbent president Pro-tem Tim Jennings of Roswell. However, Jennings told me he might seek Republican support to stay on when the full Senate votes on the position in January. Senate Majority Leader Michael Sanchez and Whip Mary Jane Garcia were re-elected to their posts without challenge. Jennings angered some Democrats when he defended Republican Senate Whip Leonard Lee Rawson -- and recorded a "robo call" for Rawson -- in the recent election. Rawson, of Las Cruces, was defeated by Democrat Steve Fischmann.